Two captive dolphins have been successfully returned to the wild - raising hopes that more trapped creatures can be rescued from their tanks and cages. 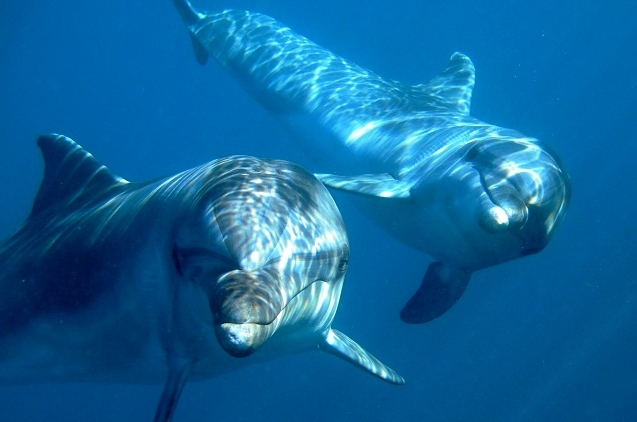 Bottlenose dolphins Tom and Misha were originally captured off the coast of Turkey and used to perform tricks and provide 'swim-with' opportunities for tourists. "The rescue of Tom and Misha has made history," said Adam M Roberts, chief executive of the Born Free Foundation, which has just published its report on the 'Back to the Blue' project. "We now have the hard evidence that it is possible for these animals to be successfully and humanely returned to the wild. But freeing dolphins from captivity isn't easy. Because dolphins are so smart, they need to be challenged so they don't get bored. In captivity, dolphins don't receive the natural and adventurous lives they're built for. Tom and Misha are two dolphins who lost many of their wild instincts and behaviors in captivity, so when they were rescued they were brought to a sea pen where they worked with special trainers for 20 months to ensure they had the skills needed to survive. Responses to "The Beautiful Moment Two Captive Dolphins Return To The Wild (Video)"